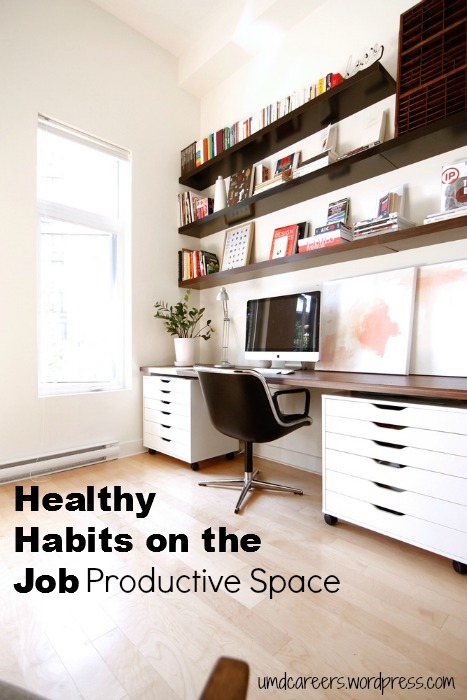 Today, we will be talking about keeping a productive workspace as a healthy habit for on the job. Where you work can vary. Some people work in a cubicle, others work in an office. I would like to discuss tips on how to maintain a productive workspace when working from home, because working at home is arguably the most hectic work environment. When working at home you have family, roommates, pets, chores, clutter, food, electronics, noise, and other miscellaneous things to distract you. The following post will discuss some basic tips to keeping a productive workspace at home. Get comfortable: Anything from a soft chair, to the right amount of lighting or the right room temperature will set the mood for a perfect working environment. There is such a thing as getting too comfortable. For example, some people may be able to work lying in bed or sitting in a beanbag, but studies have shown that sitting up straight can improve your focus. Reduce distractions: Make sure your door is closed and any temptations, such as TV or other electronics, are out of reach. Also, know your learning style. Things like music can be helpful to some people and distracting to others. Even the genre of music can make the difference. If needed, make a playlist of songs you can work to. If music and sound in general is distracting to you, then you might want to invest in a pair of earplugs. Organize: Know where everything is. Shoving everything into a drawer will make your space clean, but it may not be enough. A cluttered filing system can make for a cluttered mind. Knowing where everything is will also reduce the time it takes to find what you are looking for when working on a project. Set time limits: When working from home there is sometimes the illusion that you have plenty of time to accomplish your daily tasks because you save time commuting, socializing, etc. This illusion can be trouble. If you set reasonable time limits throughout the day completing tasks, then you will feel pressured to work harder. Create Inspiration: This tip may not be helpful for everyone, but it’s a cool concept. Creating a workspace that inspires you can give you that extra motivation you need to be productive. If you have an idol that you admire, hang a poster of them above your workspace. If what inspires you is a quote, frame that quote or put it on a sticky note on your computer. A memento, family portrait, award, invention…literally anything that gives you inspiration! These five tips are meant for working at home because this is when you have the most control over your workspace. That’s not to say these tips can’t apply to work at the office either. Give one, two, or several of these tips a try and hopefully you will find yourself being more productive than ever. 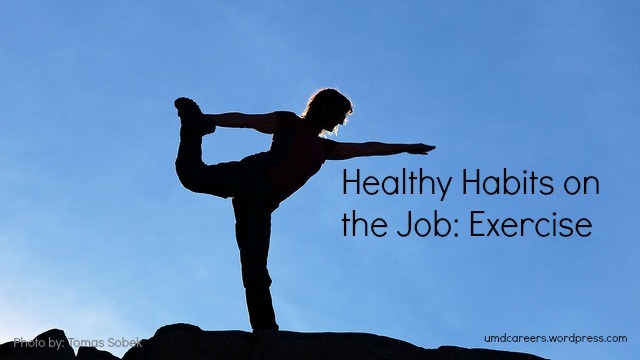 Welcome again to “Part III” of Healthy Habits for on the Job! Read the others here: sleep and eating well. Today I would like to highlight exercise. The following post will outline strategies and reasons to maintain a regular exercise routine in order to support a healthy lifestyle. Exercise can be intimidating but it is also extremely rewarding. A lot of people say they don’t have time or they’re too tired. The truth is you can make time and studies have shown that a certain amount of exercise can make you more alert. To dispute the claim that exercise is time consuming, the Mayo Clinic has found that everyone should get 150 minutes of aerobic activity a week. This is less than 25 minutes of moderate cardio work a day. If you were to increase the intensity from moderate to vigorous, then you can cut this time in half. Weight training is also something to think about. The Mayo Clinic suggests weight training at least twice a week. Dividing the cardio work between only five days and assigning weights to the other two days can decrease your workout routine total to as little as 30 minutes a day. Exercises such as pull-ups or rows can be incredibly beneficial for students and white-collar workers where you’re backs are hunched over a computer or notebook most of the day. The problem areas of the common office employee include the shoulders, upper back, torso, neck, hips, legs, and even forearms. Generally speaking, sitting in a chair all day can take a major toll on your whole body. Another point to consider is that exercise, such as running, can wake you up. A fitness and nutrition article in the New York Times talks about how running releases endorphins. Endorphins are natural chemicals produced by the body to increase the mood of a person. This is the phenomenon that people are referring to when they say “Runner’s High”. In summation, running can literally make you happier, and everyone works better when they are in a good mood. Truthfully you won’t feel like you “have the time” to exercise, which is why you have to make time. Taking the time to exercise sounds like a hassle. The reality is that exercising can be easier than you think and definitely worth it. 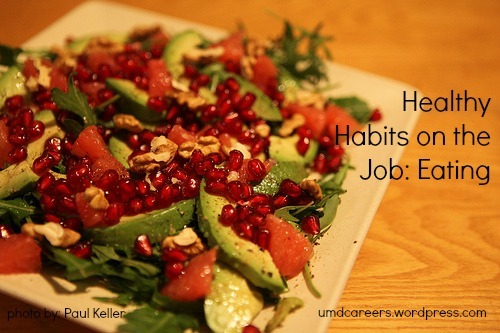 Welcome to “Part II” of Healthy Habits for on the Job! Last time I talked a bit about the importance of sleep to a healthy lifestyle. Today I would like to highlight eating as an important aspect to being a healthy employee. Below are a few tips and opinions I have developed regarding eating healthy. Eat a variety. Having a little bit of every food group in each meal covers all your body’s needs. Too much of any food group without the others is a bad idea. Eat small meals often. It may be annoying, but eating four or five small meals throughout the day is much better than eating two big meals. Eat when you’re hungry. Some people believe starving themselves helps them lose weight. This is false. Starving yourself will actually slow down your metabolism and cause your body to store more fat in the long run. But what do I know? I try to stay very health conscious, but I’m not a physical trainer or a doctor. If you want to find professional health advice you may need to sift through a lot of information out there and find what works for you. Everyone’s body is different so chances are there won’t be a single solution for everyone. A program that I highly recommend checking out would be Weight Watchers. I have seen first hand amazing results from this program. Weight Watchers is a personalized point system that regulates what portions of each food group you need to consume based off of your body type. Weight Watchers also takes your exercise into account. The program provides informational meetings lead by current members. It is a complex approach to a complex problem that is made easy through a supportive staff, online resources, and a simple iPhone app. For more information visit their website and decide if the program would be right for you. As we’re getting into the swing of the semester, I think we all start to feel a bit of a strain. Our classes are starting to test us, projects get underway, and our student organizations start throwing all these events. Where do you get enough time to do everything? Short answer: I have no idea. 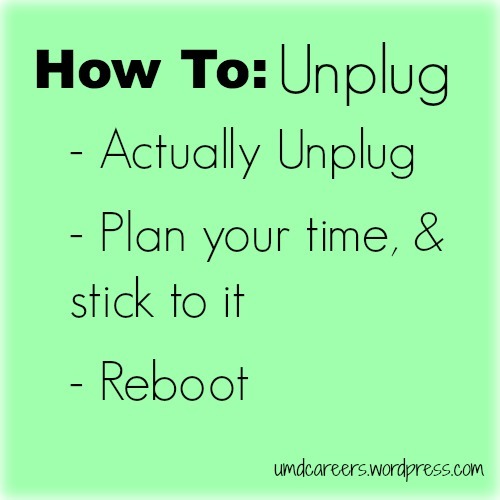 Long answer: figure out what’s important, and let yourself take time off. Here are some ideas on how to step back that apply now, and will apply even more as we move on from college and head into the workforce. How long have you been away from the internet in the last 24 hours? I’m guessing not long. Being constantly connected is a thing in today’s world, but that can get draining, especially when it means we’re not spending our time actually focusing on one thing. So take some time and go offline. Don’t sit in front of your computer all day. Let your group members know not to expect you to respond at certain times, and don’t check your email or texts. Start setting some boundaries in your work and play life. If we’re not in front of our computers all day, how in the world are we supposed to get everything done? It’s simple: actually do what you mean to do when you get in front of one. It’s hard, but it can be done. Imagine your boss or instructor is looking over your shoulder and actually focus on your work. Get what you need to done, and then you can play. Of course, I don’t mean to continually work until you finish, even if it takes all night. Take breaks, but don’t let those breaks turn into an hour of web-surfing. Sometimes there’s no chance of things slowing down. You get projects that stack up on each other, the busy season at work, or 4 tests in one day. That’s life. But you still need time to take care of you. Even if you think you have no time, you need it. Take a space and make it a stress free zone. Leave your stress outside, and focus on you. Whatever it is that calms you down, take some time and do it. You’ll thank yourself later. College isn’t so different from a “real-world” job. It has its ups and downs, and sometimes we let it take over. 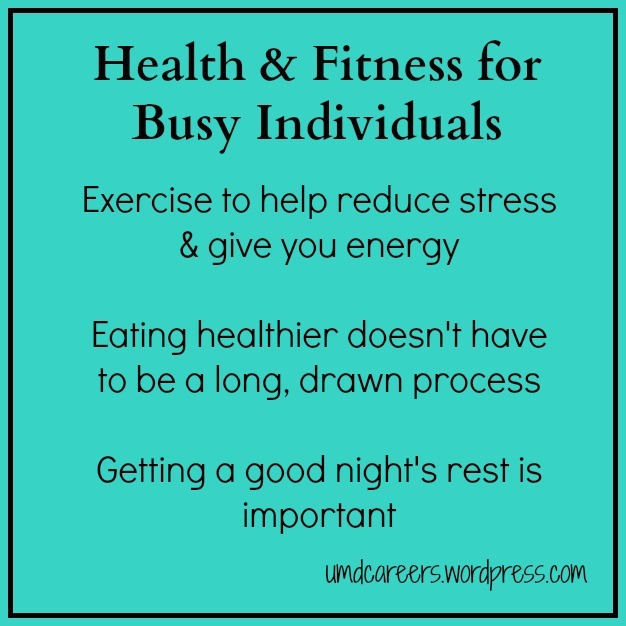 In order to be our best however, we need to spend some time making sure that we stay healthy. So take these tips, and try applying them one at a time. Change happens slowly, but if you keep applying yourself to it, hopefully you’ll be able to evaluate what you need and make sure you get it. Welcome back everyone! The beginning of the school year is always hectic. As college students, we all have a lot on our plates. School, work, family, friends, extracurricular activities, planning for the future, and whatever else you can throw on there, we’re doing it all. That leads to my story. I’ve been working here at Career and Internship Services for 2 years now. This summer, I got a job at Glensheen Mansion as a tour guide, and then I got a job in fast food. While I did cut my hours once school started up, this still amounts to at least 30 hours a week. On top of that, I’m taking upper-level required classes for my majors. Yes, majors. These are things that I’m not necessarily interested in, but need to get through my majors. Not the easiest thing. I’m also a Teaching Assistant for 2 separate classes, totaling 4 credits. As if that weren’t enough, I’m the Marketing Coordinator for QASU (Queer and Allied Student Union), and an active presenter for Peer Health Educators. 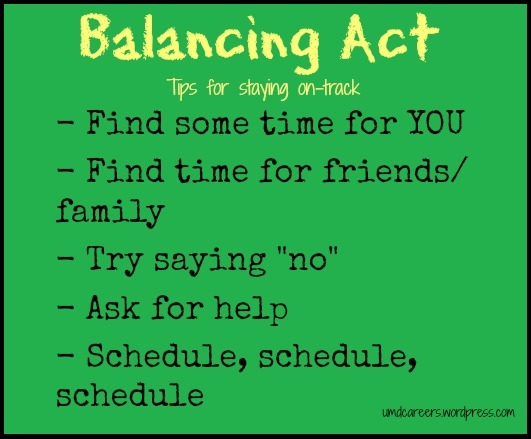 If this sounds vaguely familiar to you, I’ve got 5 tips on how to stay on track, healthy, and keep from stressing out as much. Make sure to schedule in some time for you: time to be by yourself, wrap your head around things, and in general just take a break. Go for a run every morning, take a bath, play some video games, whatever it takes for you to reset. Saying “no” every time your friends or family want you to do something is no fun, and chances are, they’re what keep you grounded. So it’s not good to let those relationships fall to the wayside. Set some time aside and plan times to be with them ahead of time, before you’re all booked up! You’re already committed to a lot of things, so why add more on top? If you’ve got so much going on you can barely fit it all in, how are you going to have time for more? So, as of right now, just say no. Give your all to the projects you’ve already committed to. It doesn’t matter if you have 10 meetings this week if you forget about half of them. Find a system that works for you, be it a planner, Google calendar, post-it notes on your walls, or using your arm as a notepad (might not be sustainable, sharpie isn’t water proof). Any way that works, just to keep you on track, and reminds you to do your assignments for everything you’re doing. Keep reminding yourself of these tips. I know I have to continually (especially the “no” part). Good luck in the new semester!